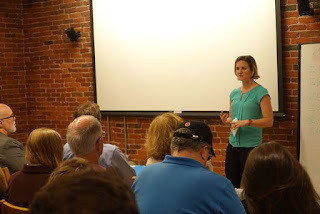 If last night’s A Better Cambridge meeting is any indication, people in the city are genuinely concerned about the housing crisis and the lack of affordability and they are looking for ways do something about it. 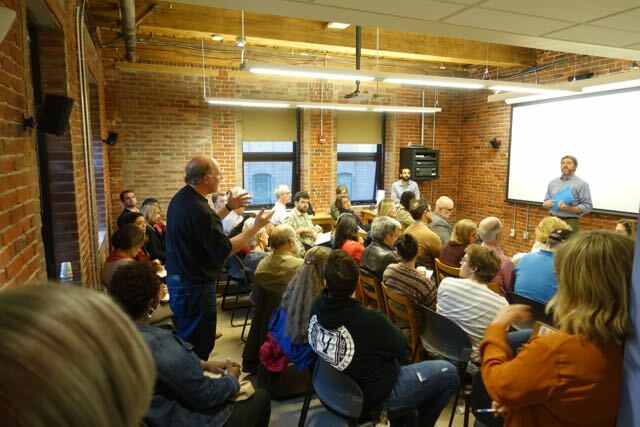 Residents packed the second floor room at CCTV to capacity to hear the city’s chief housing planner Chris Cotter talk about the new inclusionary zoning report as well as to hear Melissa Peters of the Cambridge Community Development Department outline the Envision Cambridge planning effort underway. The message from both Cotter and Peters is that we are early in a long community-based process and it is important for citizens to engage in both these discussions in the coming months. 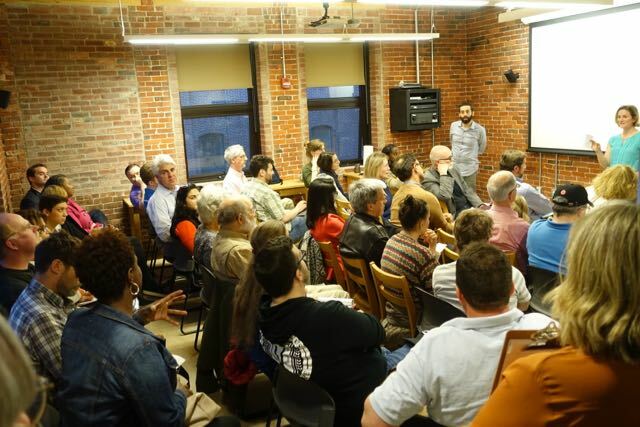 A Better Cambridge hosted last night's meeting to keep its members informed and ABC leader Jesse Kanson-Benanav was pleased with the turnout, noting that citizen involvement will be crucial, "Planners need to be informed by the people. It's critical to a creation of a successful policy, a successful plan." The housing crisis has been on Cambridge's radar for years now, as rental and sale prices have continued to escalate faster than inflation. Former CDD director, the late Brian Murphy, raised the issue years ago, though at the time there was not the political will to address it. 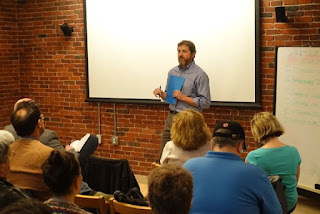 Cotter described last night's meeting as part of the question-gathering phase of the process and noted that the City Council’s Housing Committee will hold a public hearing tonight at the Citywide Senior Center on Mass Ave, the first of two public hearings in May on the subject. At the second hearing later this month, the consultant who prepared the report will be in Cambridge to hear comments and take questions from citizens. Of the many issues raised in the inclusionary zoning report, Cotter noted specifically that in the area of homeownership affordability there is a push to include income levels up to 100 percent of Area Median Income as a way of addressing the very high purchase prices in Cambridge. Melissa Peters said that the plan Envision Cambridge will be placing significant emphasis on outreach, recognizing that her ultimate challenge is to make sure that this plan, $3.3 million in the making, will not “end up on a shelf”. In response to the audience question, "What happens when the Cambridge real estate market cools and underlying economic conditions change? ", both Cotter and Peters acknowledged the need to address this in their approaches, and developers themselves have raised the issue in other forums arguing that the wrong balance of carrots and sticks may drive them away and drive down housing production. Audience comments were thoughtful and indicated a depth of passion but also a level of insight on complex and at times quite technical issues that can also be very emotional. Joining the meeting last night were city councilors Craig Kelley and Marc McGovern. ABC’s leadership team, including Kanson-Benanav, Pam Thilo, Alec Papazian and former city councilor Sam Seidel committed to make sure its membership stay plugged into both these processes going forward, and announced the next ABC meeting will look at the Mass + Main project soon to break ground in Central Square. Stay tuned for more info there.